Batting for the ‘have nots’ rather than the ‘haves’, lefty policy wonks like me don’t get to claim many policy wins – we spend most of our professional lives banging our world-weary heads against very well constructed brick walls. I think I can count only three substantive policy wins in 30 years – and one of those was later reversed, without ever being implemented, by a New Labour Home Secretary with a different view to his predecessor. So, allow me a moment to revel in the prospect of a fourth. Noting both that “the only means of enforcement [of the right to paid holiday] is to bring a complaint to an employment tribunal”, and that “the evidence from [the casework of] CABx shows that many workers are reluctant to initiate such a complaint – or even to approach their employer – for fear of suffering victimisation by their employer and even of losing their job”, the report recommended that “the Government establish new, proactive enforcement mechanisms” in respect of denial of paid holiday and unpaid holiday pay. You will no doubt be shocked to learn that New Labour ministers were not sufficiently impressed. More accurately, they couldn’t give a toss. So, four years later, I had a Groundhog Day moment when researching and writing a further Citizens Advice report, Still wish you were here. I haven’t kept a copy of that one, but as far as I can remember it was just the 2000 report with new case studies. Well, Citizens Advice weren’t paying me very much. New Labour ministers were no more impressed by that report than they had been in 2000, and only one person at the TUC took any interest (a point I will come back to). So, in 2011 – there having been a change of government, and having exhausted the report title potential of Pink Floyd’s seminal song – I researched and wrote yet another Citizens Advice report, Give us a break! That’s lefty policy wonking in a nutshell: year after year, running over the same old ground. Gina had worked full-time as bar staff in a pub for the previous two years when she sought advice from her local CAB. During this time, she had never received any pay slips or contract of employment, and had taken very few holidays or breaks from work as her manager had told her that she was not entitled to paid holiday. Over the recent few months, her monthly wages had been steadily reduced, and when she had challenged her employer about this he had said that he had been told by his accountant that Gina was “overpaid”. Further noting that the right to paid holiday was not directly enforced by any of the enforcement bodies lying behind the (since abolished) Pay & Work Rights Helpline established by the Labour Government in late 2009, the report set out the following CAB casework statistics, indicating that denial of paid holiday (or owed holiday pay) affected many more workers than denial of the rights covered by those enforcement bodies. And again, somewhat unoriginally, the report recommended that the Government establish “a simpler, more accessible alternative to the employment tribunal system” for enforcement of the right to paid holiday. Boring!!! Not surprisingly, perhaps, Coalition Government ministers were no more moved to act upon the report’s findings and recommendations than their New Labour predecessors had been. (Though I am told that the then employment relations minister, Ed Davey of the Liberal Democrats, used to regularly wave a crumpled copy of Give us a break! at his civil servants and demand to know “what we are doing about this”). Fast forward six years to the publication, in July this year, of the Taylor Review of Modern Working Practices, and its conclusion that non-compliance with the right to paid holiday (and owed holiday pay) is a serious and widespread problem. Well, blow me down. How we found, the same old fears, wish you were here. 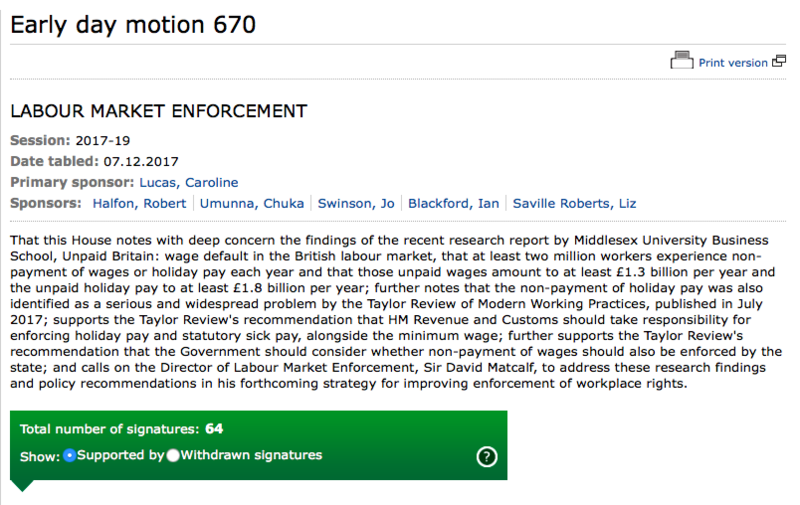 Seventeen years on from Wish you were here, the Taylor Review recommended that HMRC take responsibility for enforcing paid holiday (and also Statutory Sick Pay) for the lowest paid workers, alongside the minimum wage. And it further recommended that the Government “consider whether other pay-based protections, such as the protection against unlawful deduction from salary, are also state enforced for the lowest paid workers”. Do I not like this? Then, last week, I had the great pleasure of watching my old mate, Nick Clark – the only person at the TUC in 2000 and 2004 who had taken note of and supported my reports for Citizens Advice – making waves with a brilliant, Trust for London-funded research report (jointly researched and written with Eva Herman) for Middlesex University Business School, Unpaid Britain: wage default in the British labour market. This concludes that at least two million workers experience non-payment of wages or holiday pay each year, that those unpaid wages amount to at least £1.3 billion per year, and that the unpaid holiday pay amounts to at least £1.8 billion per year. So, today, it was good to see a cross-party group of MPs – including the Conservative Robert Halfon, Labour’s former shadow business secretary Chuka Umunna, and the Liberal Democrats’ deputy leader and former Coalition business minister Jo Swinson – call on Sir David to address the Unpaid Britain research findings and Taylor Review policy recommendations in his forthcoming strategy for improving enforcement of workplace rights. Am I about to top my long, sad ‘career’ with a fourth substantive policy win? Have I secured a walk-on part in the war? Or just a lead role in the cage? Time will tell. This entry was posted in Workers' rights and tagged Enforcement, Paid holiday, Taylor Review, Unpaid Britain, Working Time Regulations. Bookmark the permalink.